Premier Homecare, a wholly owned subsidiary of JSSA, is a licensed, nonprofit private duty home care agency that serves hundreds of families each year throughout the Washington DC metropolitan area and Montgomery County, MD. 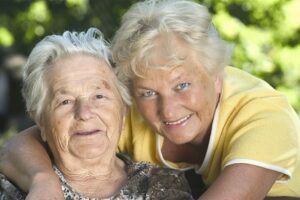 We specialize in developing, delivering and coordinating comprehensive home care management programs that allow older adults to live independently in the comfort of their own homes. Since our founding, we’ve built a strong reputation for delivering compassionate home care to seniors — and peace of mind to those who care for and about them. All of our caregivers are licensed and/or certified, W-2 employees. We do not use independent contractors. Caregivers receive ongoing training and instruction so they can embrace Premier Homecare’s philosophy for delivering compassionate, high-quality home care. Additionally, registered nurses monitor clients’ clinical status so they can adjust caregiver plans as necessary.Premier Homecare is licensed by the Maryland Department of Health Care Quality and the District of Columbia. Interested in Working for Premier?